I am so thankful that my dad called me yesterday. I am more thankful that I made the choice to drop everything from my day and take time to go be with my Grandpa and Grandma, my Dad and my cousin Brenda. I don’t have the best relationship with my dad unfortunately. We do not have a bad relationship by any means, we just are not close. We’ve had a few bumps in life that have left us pretty distant. Spending time with him yesterday allowed me to catch up, I felt no need to have anger towards him for not being a bigger part of my life, I have no regret of how life has been. It was nice to share with him the things I am doing. I am passionate about what I am doing in life right now and I love everyone and everything that surrounds me. We all live such busy lives in today’s world, we often need that reminder to slow down. Yesterday was my reminder. I spent a lot of time with my Grandparents when I was growing up. I have not made as much time as an adult to be with them. Years ago I lost my Grandpa and Grandma Stangl, my mom’s parents. 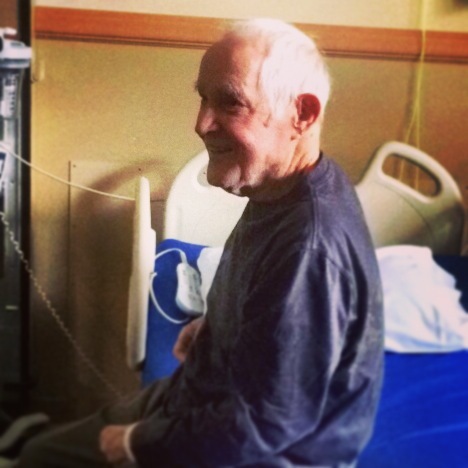 My Grandpa Stangl died suddenly so I didn’t get a chance to sit with him and say goodbye. My Grandma however slowly began to fade towards joining my Grandpa so I was able to sit with her and say goodbye. Last year when Grandma Foster was in the hospital I went to be with her, you never know what could have happened. Luckily she pulled through and is still quite the whippersnapper at 89. Even yesterday at the hospital I could see that about her. Such a strong woman. It was hard to watch her get the news and have reality set in that my Grandpas prognosis wasn’t very good. I don’t think I’ve ever seen my Grandma cry. I don’t think I’ve every seen my dad cry either. I spoke with my dad this morning and realized he has never really lost anyone close to him. My dad is 61. I can’t imagine. I lost my uncle when I was 11. My uncle was one of my closest family members. From there I have lost way too many friends, my mom’s parents, and someone who I was on a beginning of a possible relationship with. I have had to deal with death far too many times in my short time here on earth. Each death has brought pain, tears, questions, but also an appreciation. An appreciation that I have had them in my life. They have taught me something that I will always cherish. Whatever I find out in the coming days with my Grandpa, I know I will be strong for him, for my Grandma and for my Dad. That’s who I am. I am a supporter, a backbone for people. I will cry with them, but I will also smile and laugh at stories and memories of an amazing life that has been lived through my amazing grandparents. I will take these days, whether they are just that, days, or if they extend in to months and years (praying they do) and cherish every moment. Be there more. Take the time for them. They ultimately gave me life on this earth. I am starting to realize where I get all these quirks from (thanks Grandpa). I will always cherish that time I spent yesterday, holding my Grandpas hand and looking into his eyes. I will never know all that those eyes have experienced or seen in this world. 94 years of experience thus far. He gave me his story of war a few years back. It is pages and pages of his experience in his own words. I can’t wait to finish reading it. I can only hope that I can continue to learn from him and my Grandma. They have both experienced so much life. I hope to do the same and I hope to one day be where they are, still in love after 68 years. Still holding on together with hope, love and God by their side. Ian might wear them better.